At Villa San Raffaello, guests are treated to stylishly restored farmhouse accommodation with pool, extensive landscaped gardens and absolutely stunning views. Our Le Marche villa has received great reviews an elegant base for magical holidays. Apartment Grazia commands great all round views of the glorious Marche countryside and Sarnano. The two-tiered roof in this part of our Le Marche Villa has been carefully restored and exposed to reveal old beams and cotto tiles to create a characteristic and spacious feel. This apartment has three large bedrooms; a double and two twins. The double bedroom has an ensuite shower room and there is also a spacious family bathroom with a shower. The open plan living area is light and airy and consists of a roomy lounge with comfortable, high quality sofa bed and a dining area together with a well-equipped kitchen. There is an oven and hob, fridge freezer and a dishwasher. The lounge comes equipped with a movie and music player and Wifi internet connection. See our facilities page for details of music, film, book libraries and more. For alfresco eating or just a quiet glass of wine there is a choice of two dining areas in the front garden for guests in Apartments Grazia and Gigi, where you can relax in the shade of a pergola gazing at the magical Sibillini mountains. Each area has sufficient seating and tables for comfortable dining and lounging. The Italian villa includes four spacious self catering apartments and sits in an elevated position with magnificent views across the rolling Le Marche countryside to the medieval, hilltop town of Sarnano and the stunning Sibillini Mountains beyond. Sarnano has been named one of the most beautiful villages in Italy by the Italian tourist board and is home to some great shops, bars and ristorante. Like many rural houses Italy, Villa San Raffaello had many lovely architectural features and we have retained the best of these, adding comfortable interiors and many other facilities to make guests feel at home on their holidays in Italy. 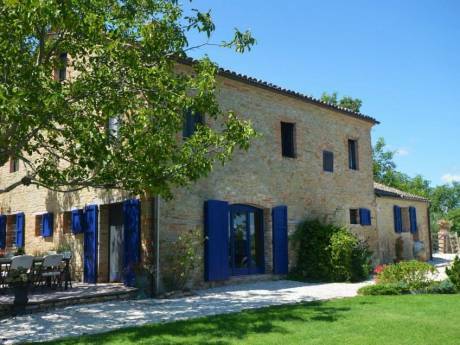 These include a courtyard garden, many shady al-fresco eating areas, a vineyard and an organic fruit, vegetable and herb garden, a movie, music and book library to provide you with the ideal setting for fantastic family holidays in the Le Marche region of Italy. Why choose our Villa for your Le Marche holiday? It's difficult to encapsulate everything that this incredibly beautiful part of Italy and our Italian villa offer visitors, so please visit our photo gallery to get a better feel for the Villa and an Italy holiday in the Le Marche region. Throughout the site we have tried to whet your appetite with information and to evoke the true flavour of this part of Le Marche. Please stop and browse our informative pages on the amazing array of sights and activities on offer to visitors to Sarnano and Le Marche. We think that you will agree with past guests and find our elegant apartments and our location a winning combination for a great Italian holiday. Visit www.tripadvisor.com and read the great feedback and all the top ratings that we have received from past guests who have chosen us for their Italian Villa holidays. Alternatively visit our testimonials page for feedback from our guest books or our reviews page with a summary of Tripadvisor and other feedback sites. We think that you’ll also find our competitive pricing policy dispels the perception that renting Italy villas must be costly. Villa San Raffaello is a piece of paradise... choose this place if you're headed to Le Marche. Le Marche itself is a tapestry of ancient cities, rolling hills, awesome mountains, hidden valleys and the Adriatic Coast with its long, sandy beaches. In short, an outstanding Italian holiday destination. The bustling medieval town of Sarnano lies only 2kms away from the lovely Villa with its historic centre and terme, it has been named by the Italian's as one of the most beautiful villages in Italy. Sarnano has a wealth of character architecture, restaurants and bars and is ideal for a family holiday in Italy, for outdoor pursuits, sightseeing Le Marche, for extreme sports or the many other activities listed on our free time page. The holiday was one of the best we have ever had... 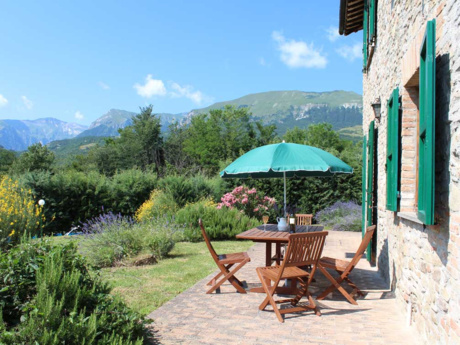 The Villa had all the amenities that we were looking for ...breathtaking views of the Sibillini mountains & the historic town of Sarnano, was perfectly located, providing peace and tranquility yet being in close proximity to local amenities. The Villa lies 1 kilometre from the Sibillini National park that protects the wildlife and medieval villages in this beautiful and dramatic stretch of the Appennine Mountains. The nearby hills and mountains are the ideal setting for that Italian walking holiday or cycling holiday. The bustling and perfectly preserved medieval town of Sarnano, named one of the most beautiful in Italy, is only 2km away from our Le Marche Villa. Sarnano has a wealth of character in the ancient, cobbled streets that wind up through wonderfully restored piazzas, churches, dwellings and the impressive towers that dominate the amazing local landscape. The history of Sarnano dates back to pagan and Roman times and is home to a theatre, museums, rennaissance art, a spa resort, many restaurants, bars, many summer festas, some great shops, bars and a helpful tourist office. Villa San Raffaello and Sarnano is an ideal base for outdoor activity, like parascending or climbing, for exploring the Sibillini mountains or, the Monti Azzurri, the smaller foothills that surround the villa, on a walking or cycling holiday. It's ideal for sightseeing and touring the medieval towns in the surrounding Le Marche countryside and for visiting the beaches of the Adriatic Riviera beyond. Alternatively, simply kick back and enjoy the local art and history, and the fantastic food and wine on offer at the numerous local bars, shops, ristorante and delicatessens. For night owls theres even a late music pub ""Sticky Fingers"" and a nightclub ""L'ex"" that plays Jazz until midnight and then something more funky for hunters, farmers and clubbers. We love your spot here in Sarnano and have loved our time with you in this special place - It's truly hard to tear ourselves away and we will surely be back soon. The local thermal waters are claimed to be beneficial for many complaints and the Spa or Sarnano Terme itself offers visitors health and beauty treatments in lovely surroundings at a reasonable cost. There are also other local beauty farms offering massages and beauty treatments nearby. These seasons are the best time to immerse yourself in the wonderful colours of the Le Marche landscape that envelope the villa. In Spring the snow still frosts the Sibillini Mountains but much of the area is carpeted with flowers and a wonderful setting for hiking holidays, cycle tours and for photographers and artists alike. In Autumn, the vendemmia or wine harvest takes place against a backdrop of gold and russet trees and an ideal time for that wine tour, walking holiday or Italian touring trip. Sarnano's Summer is one of the liveliest in Le Marche and full of long, balmy days, al-fresco eating and back to back festas, medieval fairs, exhibitions, concerts, opera, theatre and banquets. Within 15 minutes you can reach the ski resort at 1500m, temperatures are up to 10degrees lower and perfect for hiking up to the peaks at 2000m or more or for swimming in acquamarine lake Fiastra. Sarnano has year round tourism thanks to its warm climate for most of the year and to its ski resort 15 minutes away at Sassotetto. The skiing and boarding are well organised and all facilities are catered for, there's even a local ski club. At Christmas time, the snowy backdrop of the mountains, the illuminations and the tree decorations transform Sarnano into a magical, festive place to spend a memorable Christmas break. There are numerous events including a recreation of Bethlehem and the nativity in the Centro Storico, with many of the locals in medieval costume demonstrating traditional crafts. Le Marche is all of Italy in one province, and it is certainly one of the greenest, prettiest, friendliest, and most civilised corners of Italy. The region is bordered by neighbours Tuscany, Umbria, Abruzzo and Emilia Romagna and shares many of their best geographical features, yet is relatively undiscovered and surprisingly accessible. The Villa is 5 minutes from the Sibillini Mountains which are one of the highest sections of the Appenines. They are 40km long, contain 10 peaks in excess of 2000m- the whole area is home to many species of rare wildlife and is protected by the Sibillini National Park. The geography of Le Marche between mountains and sea consists of vine-clad hills, medieval villages and a rich mosaic of farmland. The Sibillini Mountains and the Marche countryside below are laced with paths and old mule tracks and are home to a stunning array of flora and fauna. It is a paradise for those who enjoy Mountain holidays, hiking, walking holidays, or a cycling holiday. Le Marche; arts and crafts, opera and theatre, medieval towns and more..
We shall never forget your lovingly restored villa- with its stunning panorama of the Sibillini Mountains- our visit here has opened up a treasure chest for us where we have discovered the glories of this fascinating region of Italy. The Marchiaghiani, or people of Le Marche, remain closely linked to the land and life here is centred on the family and on self-sufficient communities of farmers and craftsmen, where the local Le Marche market consumes most of the local produce. The wonderful medieval Le Marche towns offer the visitor an amazing range of history and historic architecture, that ranges from Art Nouveaux villas to characteristic stone cottages, and are home to wonderful art, over 1000 working theatres, fantastic markets and year round festas where you can sing and dance, eat and drink great local fayre, and enjoy the local crafts and customs. Tolentino: A lovely Marche town that’s home to Saint Nicholas, a Napoleonic battle. Ascoli Piceno: Fantastic travertine Piazza, sophisticated bars, cathedral, art & great wines. Macerata: Classy historic centre, theatre and the amazing open air Sferisterio opera house. Urbisaglia/Abbadia di Fiastra: Roman ruins, castle, monastery, museums, park & ristorante. 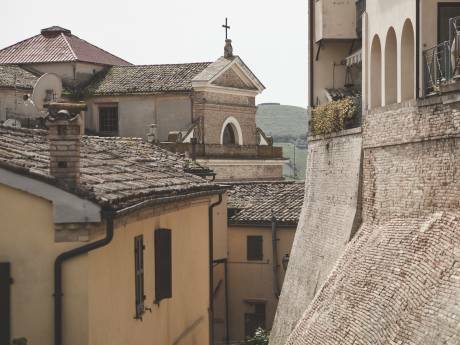 Jesi: A beautiful preserved fortified medieval town that’s home to Verdicchio wine. Fano: Roman and medieval architecture mix in this classy town. Pesaro: One of the main Northern Marche towns, lovely beach and shopping. Civitanova Marche: Buzzing seaside town that comes alive in the Summer. Ancona: Large Italian port and the Le Marche capital. Senigallia: Largest Marche beach resort, lovely historic centre, great ristorante and nightlife. Urbino: Well heeled town in the North of Le Marche famed for its renaissance art. Sarnano: The local medieval town, one of Italy's most beautiful & only a ten minute walk away. Conero National Park: On the Adriatic Riviera near Ancona, home to Sirolo and Numana- sandy coves, long beaches, shopping, eating and the home of Rosso Conero wines- great for wine holidays or wine tours. The Villa lies 1 kilometre from the Sibillini National Park that protects the wildlife and medieval villages in this beautiful stretch of the Appennine Mountains to the South West of Le Marche. In the Sibillini Mountains you will find 10 peaks in excess of 2000m, rivers, stunning waterfalls, caves, gorges and lakes, all within easy reach of the Villa. There are also many local information centres where you can find out more about the area’s tracks and trails, flora and the fauna and abbeys and monasteries. The park tourist website has a wealth of information on the area and the main events and places of interest. Alternatively, you can purchase the detailed topographical map of the area. The pool was great after a day walking in the Sibillini National Park- thank you for a very special restoration that provides such an elegant apartment. The Sibillini National Park Information centres will advise you on the area , it's geography, history and where to spot local flora, fauna and wildlife including deer, bear, boar, wildcats, wolves, porcupine, peregrine falcons and golden eagles. The dramatic landscape, with a highest peak of 2500metres, flower filled plateaux and the rolling hills below, offer an ideal location for walking holidays, cycling holidays, bird watching, photography, drawing and painting. The Sibillini National Park has organised tours and treks throughout the spring, summer and autumn months and has numerous predefined itineries available. There is Parascending, white water rafting and extreme sports on offer nearby, two of Italy’s most stunning gorge walks and mountain lakes with beaches and trattorias. Le Marche’s Sibillini Mountains, in the central Italian Appennines was named after the Sibyl, a mysterious prophetess, who was condemned by God to dwell in a mountain cave, with other demons, until judgement Day, in punishment for her adverse reaction to the news that she had been overlooked as Mother of God, in favour of the Virgin Mary. Villa San Raffaello, Sarnano is situated between Pescara (1hr 45mins) Perugia (1.5hrs) and Ancona (1.5hrs) airports, all of which are serviced by low cost Ryan Air flights. It is also worth considering flying to Rimini (2hrs 15 mins), Bologna-Forli (2.5hrs), Rome (2hrs 45mins) or Bologna (3hrs) as British Airways and Easyjet and a couple of other smaller airlines provide low cost flights to these destinations from a wide variety of points in the British Isles. Once you have booked please visit our link on google maps, download the map facility to ""get directions"" from your point of departure. The Le Marche Climate is categorised as Mediterranean, the weather in this region of Italy having hot summers and cool winters but whatever the season, the weather in Marche provides the visitor to Villa San Raffaello with a beautiful backdrop to this ever changing landscape. From Mid March temperatures often shoot up into the 20's and most days are filled with warm sunshine, however the region tends to have one or two cooler days each month with rain or drizzle. Night temperatures can still be quite cool. Summer is hot and dry and, after a few light showers in May, there is normally very little rain until late September. Some years, after very hot weather from mid July to mid August, brief but spectacular electric storms may occur. Whilst these can be accompanied with heavy downpours, they often occur without rain. This season is warm and balmy and amazingly beautiful. The majority of the time the weather is still good with temperatures still over the 20 mark into November and sometimes December. The landscape colouring becomes more vivid with bright yellows, oranges, reds and russets, illuminated by the spectacular sunsets at this time of the year. It is time for harvesting grapes and olives, for the wild boar hunting and for collecting an abundance of wild treats from nuts to mushrooms and truffles. Snow begins to fall on the mountains in late November/early December and gradually falls at lower altitudes as the winter progresses. The atmosphere is drier than in Northern Europe as the winter sun is higher in the sky and will warm you, irrespective of cold air temperatures. Whilst the ski season at 1500m can last 3 months or more, the snow at low altitudes usually lasts a couple of days. Although snow chains or special tyres are obligatory in mountain areas during winter, the commune's are very adept at keeping all roads passable and they are rarely required around Sarnano and the Villa. The mouth watering food of Le Marche exploits the wonderful produce from Marche's fertile farmlands and the Adriatic coast and you will find that you can eat traditional Italian dishes at local marche restaurants at a fraction of UK costs. Alternatively, you can pick fresh organic ingredientsin our gardens and prepare marche recipes yourselves at the villa. The following are a few of the local marche dishes & cured meats and cheeses on sale at the local markets. Brodetto is a famous fish stew from the Adriatic coast and varies in form from each coastal town. Le Marche's version of Brodetto includes red and grey mullet, cuttlefish or squid (or both), oil, garlic and saffron - served on either fried or toasted bread. Other seafood favorites include the port of Ancona's dried codfish, which is not native to the Mediterranean and local varieties like sole, bream, clams and mussels. Vincisgrassi is the lasagna of Le Marche made with ground pork, mushrooms, tomato and bechamel sauce, sometimes topped with local truffles. Favorite meats include cinghiale (wild boar), pork, veal, rabbit and hare, game birds (quail, pigeon), chicken and goose. Fabrizio, who lives 300 metres from the villa, produces and sells really sweet flavoured prosciutto (ham), porchetta (suckling pig stuffed with fennel and garlic), salamis, ciauscolo (a soft spreadable local salami), sausages and other Marche specialities. Words cannot do justice to the wonderful views when opening the curtains in the morning in our apartment at the Villa San Raffaello. Pecorino cheese, either young or old, fresco or stagionato are also produced locally, as are wonderful ricottas. Michelangelo owned land near Urbino, which produced a cheese named Casciotta which is still made today and has a wonderfully creamy, smoky flavour. Truffles (tartufi) are another Marche delicacy that are found in many local dishes, the most common in the region being the rarer white truffle, worth many times its weight in gold. Less expensive, but as delicious are the wild forest mushrooms and Porcini found in the late summer and autumn. Truffle hunting trips can be arranged if you visit at the appropriate time of year. These include a Pizza Dolce, or sweet pizza and Frustenga a cake made with raisins, figs and walnuts. Breaded olives stuffed with spiced meats, olive d'ascolana, originate from Ascoli Piceno, Le Marche and are available as an antipasto in most restaurants. Lentils and other pulses are grown on the Piano Grande in the middle of the Appenines and are often eaten with zamponi (stuffed pig's trotters). You will probably notice different names for marche restaurants besides ristorante, such as osteria, trattoria, agriturismo and pizzeria, but rest assured that all serve up a range of great Italian dishes to savour. Sarnano itself is well served by numerous pizzerias, five agriturismi/farms serving rural fayre using traditional Marche recipes and seven osterie/trattorie (well priced and serving rustic dishes). We are fortunate to have eaten at the majority and have listed some of the best on the Restaurant page to help you in your search for a taste of the real Italy. Sarnano, a short drive from the villa, is well served by numerous ristorante and pizzerias. You will probably notice different names for restaurants apart from ristorante, such as osteria, trattoria, agriturismo and pizzeria, but rest assured that all serve up a range of great Italian flavours to savour at about €15 a head or €7 at a pizzeria. Some of our Sarnano favourites are listed below plus a few selected others. Please note that it is worth booking in advance as they will often prepare extra dishes. Also prepare yourselves for the ‘talking' menu as many of the restaurants will tell you the choices available rather than give you a menu. The Villa and Le Marche has so much to offer in the way of great scenery, excellent walking, interesting historical sites, brilliant restaurants at fabulous prices- Please can I come again. (0733 657571) an agriturismo lying behind the villa, a relaxed atmosphere, good antipasti, try the truffle tagliatelle, outdoor space which is useful if you have children who like to play while you eat. Just out of Sarnano, 200 m towards Macerata, good pizzas/pasta and an excellent tiramisu. (0733 694103) Good, robust seasonal menu and excellent wines and Belgian beer menu at this restored Franciscan monastery. (0733657416) Buzzing bar with pool table, juke box and video games, serves up a mean pizza and is very reasonable. Take aways available. Crispin is an English gent living in the hamlet above the villa and cooks up a mean 4 course meal using his own organically grown produce and locally reared meats. Booking by us essential. (0733 905499) If you fancy pushing the boat out and eating somewhere very stylish and ultra modern then this comes highly recommended. The food is only a euro or two more expensive per dish and the menu is split between meat and fish (brought fresh from the coast every day). (0733 656517) A real gem, this is an eating club (your party will have to join the club- annual subscription of €2) with a limited but tasty choice of local dishes at ridiculously low prices. (0736 848755) Drive 15mins to Amandola and down the hill towards Communanza, take the right fork for Montefortino, the ristorante is 1km on your right. Quite a sophisticated feel about this restaurant that cooks regional cuisine to a very high standard. You need to book this little Gem a day in advance, but its worth the wait as all ingredients are from Marias own garden and farmyard including wines honies fruit and vegetables, most of the poultry , the wild boar is hunted around the ancient village of Sarnano. A visit to Tennacola is like being invited into an Italians home and being treated to the most amazing rustic fayre- A 4 course meal with wine costs about €20. A superb mountain restaurant with great views and a lovely terrace for al fresco eating- right near the wonderful aquamarine lake Fiastra in Le Marche's Sibillin Montains. The hearty mountain food is wonderful and includes superb prosciutto, cinghiale in Vernaccia with pappardelle, Stringhozzi with wild herbs and roast vegetables, a wonderful stew with olives and shallots and plates of roast onions with our lamb kebabs. 2 Courses €20, 3 courses €25 . Beware pasta portions are enormous, share them ans hold out for the next course. Set in one of the oldest buildings outside the medieval Centro Storico of Sarnano, the hotel, positioned in a prime position in the main square, has been lovingly restored with an art Nouveaux frontage and lavishly styled bar and ristorante. Food ranges from superb pizzas to home made egg pasta, accompanied by a fine wine list and a very naughty gelateria. Prices for a pasta or pizza dish are a very reasonable €7. We are a family from Southern England who moved to Italy with our 2 kids in 2004. Maybe it was the Italian family roots years ago that fuelled our love of Italy but we arrived in Italy in need of a challenge and a desire for a caring community in which to raise of children. We are all lovers of music, (Damien loves his football), interesting architecture and design, outdoor life and a sustainable lifestyle this is all reflected in the Villa, the gardens and the farmland, where we steadfastly refuse to use chemicals (even if it means endless hours of Summer weeding).Whilst the children are at the local schools we are avid walkers and have travelled extensively through the region, exploring wine cantinas, fiestas, museums, towns etc and we always try to pass our knowledge on to our guests.